Events listed below are scheduled to help students learn more about the Design Career Fair, other ISU career fairs, and prepare to attend. Take a few minutes to learn tips for using CyHire and learn what employers are participating in the Design Career Fair and other career fairs on campus! Hear from students that participated in past career fairs! Learn what they took, what they said, interview questions, and more. No appointment needed! Stop by for a quick resume check before the Design Career Fair. 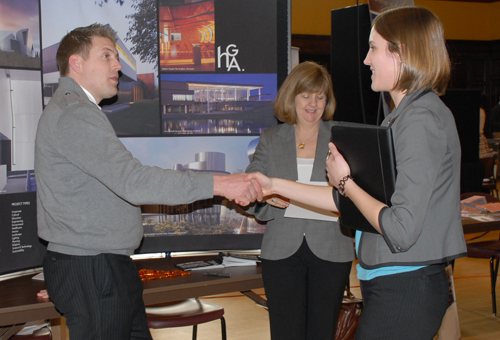 Design students should be prepared to interact with firm representatives in a professional manner during any ISU career fairs or campus events. Preparing: Begin by researching the participating organizations and working on your resume and portfolio. Practice introducing yourself and speaking about your career interests, skills or projects. Current lists of participating organizations for all ISU career fairs can be found on CyHire. Visit the students section of the Career Services site for resources related to cover letters, interviewing, networking and more. Attire: You should dress professionally and similar to how you would dress for an interview. Business suits, slacks, collared shirts, ties, khakis, and knee-length skirts are generally appropriate. When in doubt, overdress and dress conservatively. What to take: Bring copies of your resume, your portfolio, and something to use to take notes. A padfolio will give you a place to keep your resumes, store any business cards you collect. Be ready to: Introduce yourself and engage the firm representative in conversation about the organization and their work. Share a resume and portfolio. Discuss how your qualifications, experience, and professional interests fit with what the organization does. Keep track of who you met and what you discussed; ask for contact information or a business card so you can follow up after the event.